The professional window cleaner depends on many tools to get the job done. Many of these tools are essential, but none more so than holsters, belts, and pouches. Holsters carry the window cleaner’s squeegees and washers. Pouches carry an assortment of necessary tools such as towels and steel wool. The belt keeps all these items secure around the window cleaner’s waist for easy access whether that window is ground level or three stories up. With every tool though it’s important to understand how it works. Here are the important points to consider regarding extension poles for window cleaners. Belts are the first component in this assembly a window cleaner needs. Belts can be adjusted to a person’s waist size. Each belt has its capacity, with some ending at 32-inches and others reaching up to 42-inches. Most belts available are made out of durable nylon to ensure long life and have a quick release buckle. The number of loops a belt has will vary, although most belts have one to three loops. These loops can be used for squeegees, towels, or whatever other tools may be needed when working. Belts are meant to be worn over existing clothes and won’t replace a regular belt. Once the belt is on and adjusted, the next step is to add holsters. 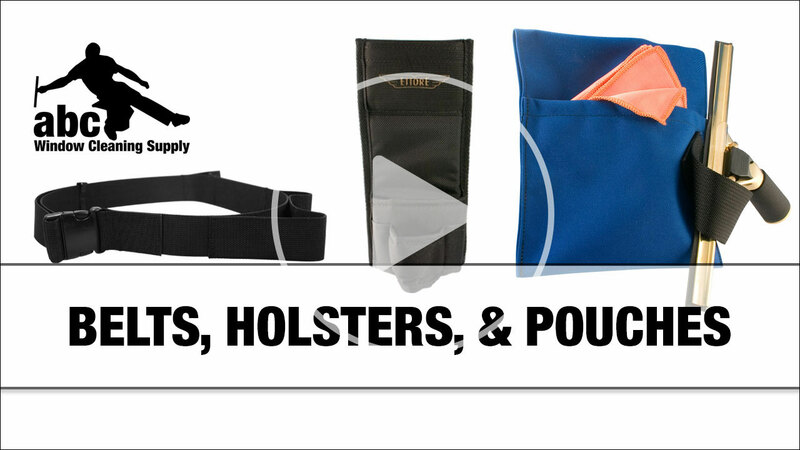 There are a few main things to consider when choosing the right window washer holster. How many loops a holster has will define how many tools it can carry. Holster loop sizes will also vary. Holsters with two or more loops will often have those loops at different sizes so they can carry a variety of window cleaning tools. Smaller sized loops are usually intended for squeegees with larger loops intended for washers. Most holsters are made from either nylon or leather. The choice of material is a personal preference. The final aspect to consider is how the holster will attach to the belt. There are two main ways this happens. First is when the belt passes through a loop. The second is when the holster has notches through which the belt will pass. 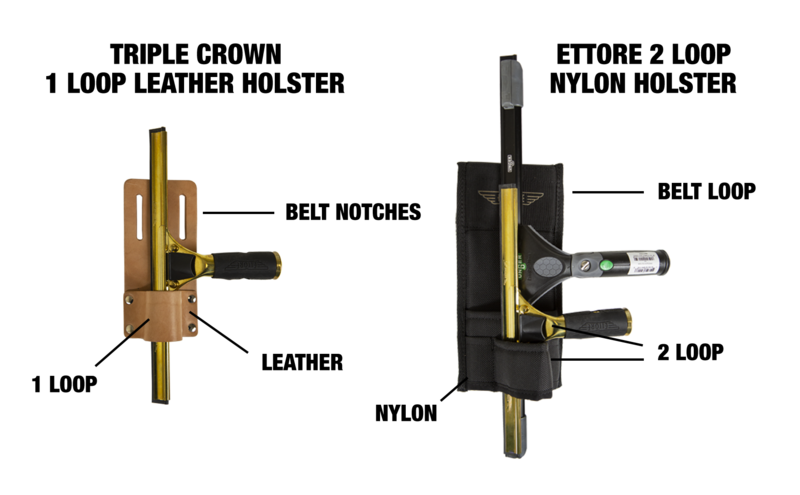 Another type of holster a window cleaner is likely to have is a scraper holster, such as the Triple Crown 1 Loop Leather Scraper Holster. Scraper holsters are just like other holsters except that they are specific to scrapers. They usually keep the cover and blade covered for extra safety. 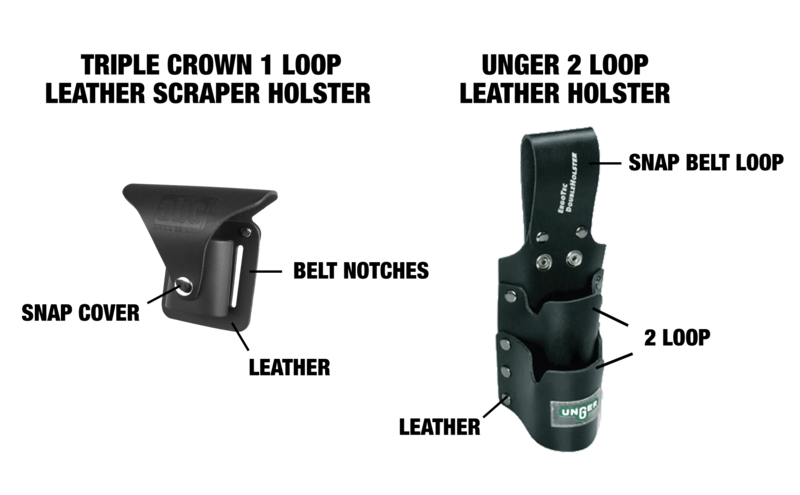 The Unger ErgoTec 2 Loop Leather Holster is an example of a specialty holster. 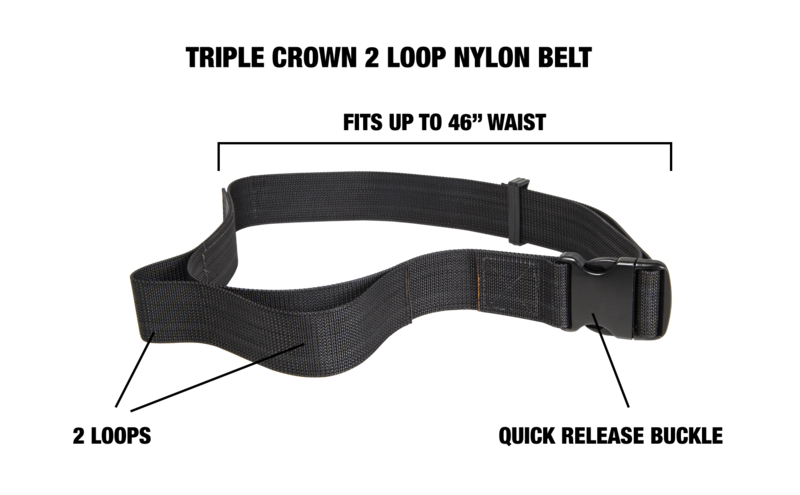 What differentiates this holster is that it is part of the larger ErgoTec belt, holster, and pouch ecosystem that has been designed to work together. Because of the specialty of the ecosystem, it doesn’t work as well with other brands. Unlike other holsters where the belt will run through either a loop or notches, this holster uses snaps to secure itself to the belt. In addition to holsters, many window cleaners like to have pouches on their belt. The difference is that the pouch has an enclosed pocket into which can be placed small items like bronze wool, and these items won’t fall out the bottom. 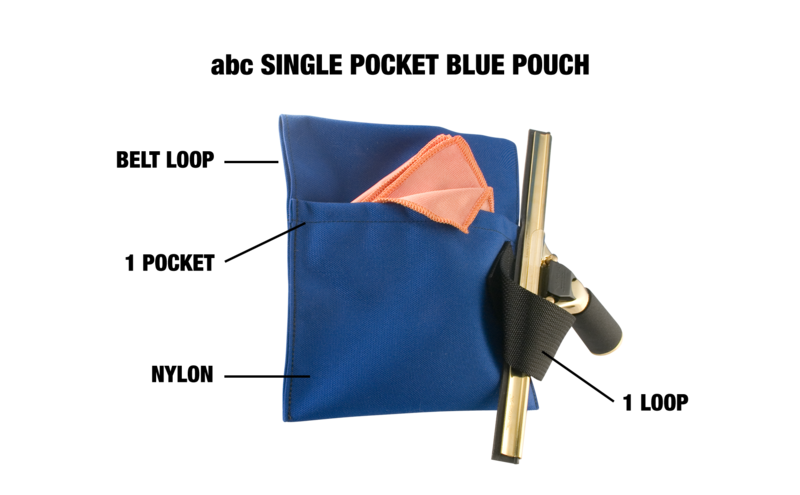 Many pouches combine having inclosed pockets along with loops for holding items like squeegees. The number of pockets, as well as their sizes, will vary depending on the pouch. Pouches will commonly have one to three pockets, but some specialty pouches can have more. A three pocket pouch will often have two large pockets for carrying a multitude of tools, and a smaller pocket ideal for securing razor blades or car keys. Pouches are made of durable nylon, although the material of specialty pouches can vary, and attach to a belt by having the belt pass through a loop. Whether the window is an easy ground level or a high third story, holsters, belts, and pouches are essential for every window cleaner. Luckily, there’s a style and type available to fit the unique needs of the window cleaner. To learn more about what each holster, belt, and pouch offers, explore their descriptions on the abc website.